Procuring the right rough stones is the critical first step towards ensuring a fine quality gemstone. We buy roughs directly from the mines. This calls for sound knowledge and years of experience. And that is why, our top-management relies only on its own efforts and expertise for procuring the rough stones. The rough stones are put under close scrutiny and examined piece-by-piece to remove poor quality stones. The clear and spotted roughs are also separated at this stage and sorted on the bases of their color and transparency. We ensure that only good stones move to the cutting stage. The pre-forming starts only after the skilled and experienced cutter has thoroughly studied the rough crystal from every angle against a strong light. Each stone, as nature makes it, is a unique individual different from any other. It has a specific character and personality. And that is why, good faceting calls for best of both the worlds : scientific techniques and traditional expertise. Often, the latter more than the former. Each emerald is meticulously machine-cut for perfect shape and calibration. It takes years of experience and skill to get accurate facet junctions, center-tipping and correct gem-height for extraordinary brilliance after setting. 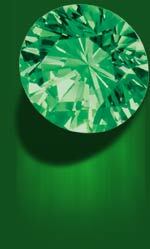 Emeralds are not put to any chemical treatment and their natural characteristics are retained. We carry out a vigorous & minute examination of the gem at every stage to ensure high precision and quality-our cutting edge. During the entire process, each gem ends up being checked over a hundred times. This passion for quality enables us to provide very fine quality gems, given the limitations of their natural characteristics.